The Unspoken Language of Love. On Sunday, when we celebrated our son’s 11th Birthday, it was about so much more than cake, presents and even the much anticipated party. It was a golden opportunity to show our son how much we love and cherish him and for him to sparkle like a diamond in the candlelight. There’s nothing like your birthday! If you read my last post, you’ll understand that celebrations have become quite a production and I wouldn’t be surprised if it soon finds its way to Broadway or London’s West End. I’ve already dealt with the cake. Now, we’re onto the presents…or THE present, in particular. You see, I gave Mister a second-hand Australian Army uniform, which I chanced upon at a local opportunity or thrift shop. Choosing gifts is something I take pretty seriously. I really do try to slip inside someone else’s skin, walk around in their shoes, see the world through their eyes and their soul to find that “Wow thing”. That thing which makes their heart sing. Not only because they love it but also because they know I understand. I get them. This gift, therefore, somehow reflects that very special, often concealed inner self or perhaps the seeds of that very precious dream, which are just waiting to germinate, flourish and grow yet are still so tender, tentative and so very embryonic. To put it simply, gift giving is a great way to show empathy, which is such an important component of love. It is the life-giving force which enables us to grow and reach for the stars. After all, don’t we all know it when someone gives us something which misses the mark entirely or when our significant other gives us something so impersonal that it could’ve come from a stranger? These gifts affect us in a different way, so often stabbing a knife through the heart. Quite bluntly, they clearly don’t understand you at all!! Although I don’t always find that perfect present which fulfills all these hopes and expectations, I did find the perfect gift for Mister and I couldn’t wait to see his response. As I mentioned, I bought Mister an Australian Army uniform I chanced upon at the op shop. Mister wants to join the army when he grows up and although I’m not keen, I pushed my own feelings aside and supported my son. Of course, the uniform is way too big but dreams are like that at the start. We have to grow into them. More than just being an army uniform, this was a very special birthday present from me to him. It said I can put my values and desires aside to respect and nurture his dreams and encourage him to grow up and be himself, rather than trying to shape and mold him into who or what I think he should be and, in effect, turn him into a bonsai…a pruned and shrunk down version of who he was meant to be. You see, in my youth I was pretty opposed to armies, war and battles. I even took part in protests against Australia’s involvement in the Gulf War and marched through the streets. I wouldn’t describe myself as a pacifist but I’d definitely be of the view: “Make love not war”. 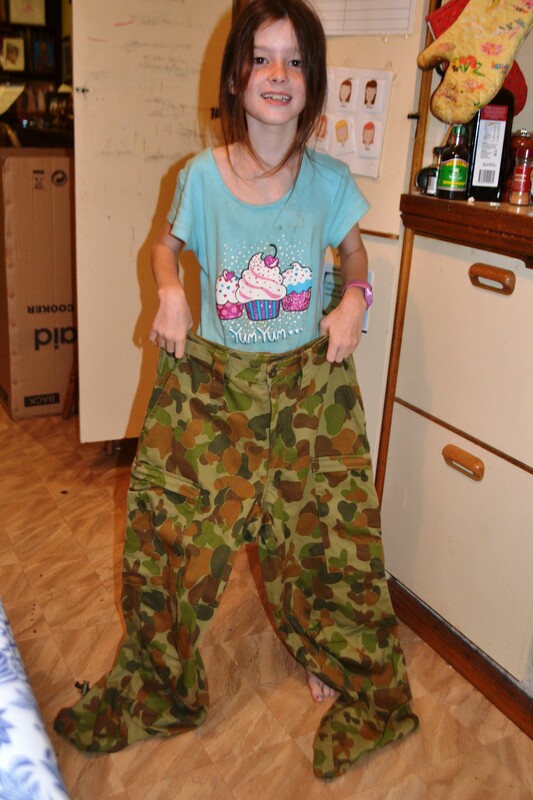 Miss is dwarfed by the army pants. I’m also a person who, at least I hope, has principles and have built up something called “character”. This means having values and standing up for what I believe in. Before the kids were born, for example, there were going to be no Barbies, no guns and definitely no signing up and joining the army. But as much as you bring up your children, they also modify you and seeing pure happiness and joy glowing on your child’s precious face does tinker with these values a bit. Or, at least, it does for me. Hate to admit it but a persistent campaign of incessant nagging by your kids can also make an impact on all you held dear as well! 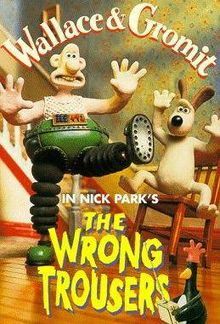 Watching the kids with the army pants reminded me of Wallace & Gromit in the Wrong Trousers. I’m sure Mister didn’t appreciate what giving him that army uniform represented. Of course, he doesn’t know just what a seismic shift it is for me to embrace his love of the army. While I love any form of history and honour our ex-service people and collect memorabilia and books from WWI and WWII, that’s very different from having your one and only beloved son go and sign up. That possibility, though still a long way off, does trouble me a bit because I was also his age once and that was when I decided to become a writer and I’ve never veered off course. Writing is like breathing and I even write in myself. Actually, truth be told, I’m often writing when I should be asleep!! I knew that’s who I was when I was 10 and it was set in stone. However, as much as I have marched and protested going to war, I also felt it was important that I support my son in how he sees himself and in pursuing his dreams. Recognising who he is as a person and empowering him to walk in his own shoes instead of trying to impose me or my values on him like an iron on transfer. Just because someone is young, it doesn’t mean their dreams and values aren’t precious and worthy of recognition and respect, even if we would rather they pursued a different path. 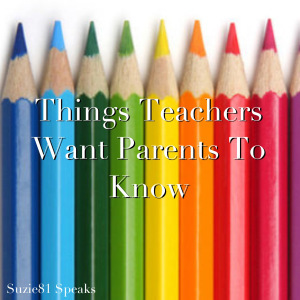 Our children need to know they can trust us with their dreams and aspirations. After all, they come from the very heart of the soul and are so very, very precious and need to be handled with kid gloves … certainly not ridiculed or rejected. That, would be like stomping on the precious wings of a beautiful butterfly which, having just emerged from its chrysalis and waited for its tender wings to dry, is about to take its first tenuous flight…and this is your child who is so much more worthy than that. So I gave him the army uniform and made him happy. So happy that he took the army uniform to school on Monday, particularly to show his teacher whose son is in the army. He was as proud of punch and he truly respects all that the uniform stands for and what it means to fight for your country. Well, as much as you can when you’re an 11 year old kid and war is on the other side of the world and it’s not in your own backyard. So I managed to get it right. After all, was it just coincidence that I strayed across that army uniform in the op shop or was it meant to be? Serendipity? God? Destiny fate? This isn’t just an erroneous question. 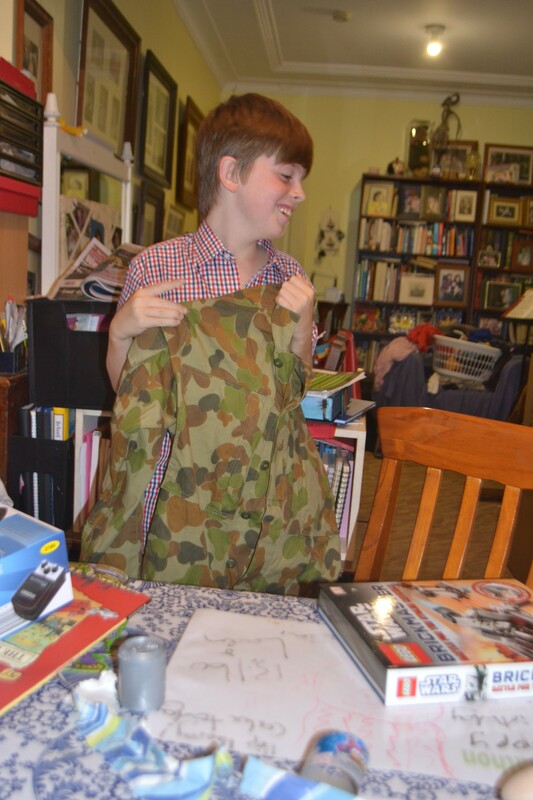 I am an op shop addict and I have never seen an army uniform for sale in an op shop before and yet there it was just a couple of weeks before Mister’s birthday. As much as I might have decided to stretch myself well beyond my comfort zone to encourage his dreams, I also suspect I was nudged. By the way, I should point out that while I was protesting, Geoff’s brother was actually in the Australian army and Mister has grown up with Uncle Terry’s slouch hat in the house. Geoff’s Great Uncle Ralph French died in France during WWI and we have been down to the Australian War Memorial as a family to honour him and we even participated in a special memorial service they hold each day and we laid down a wreath. Another Great Uncle served in Gallipolli and went on to serve in Beersheba in the Australian Light Horse. So it would seem that joining the Armed Forces are in my son’s blood. This entry was posted in Australia, Compassion, Love, Parenting, Personal Development and tagged army, army uniform, Australian Army, Australian Army uniform, Barbie, birthday cake, birthdays, character, charity shop, dreams, empathy, friendship, gift, gift.gifts, gifts, giving, happiness, Happy Birthday, life lessons, love, Maria Shriver, mom, motherhood, mum, Mummy, op shop, parenting, present, presents, serendipity, soul mate, thrift shop, understanding, uniform, visions, Wallace & Gromit on March 11, 2015 by Rowena.